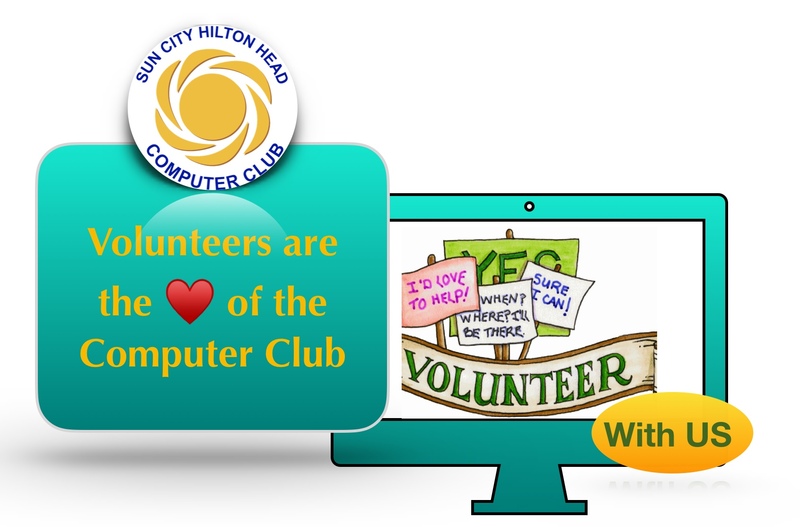 The Sun City Computer Club welcomes volunteers to assist with our various programs. Anyone can contribute. For most of the opportunities, no experience is required – just a willingness to get involved and help. Training is usually provided for more involved volunteer roles. Here’s your chance to increase your skills while assisting others! A monitor is an important member of the Computer Club operation. No activity can proceed in the facilities without the presence of a monitor on duty. Club members are encouraged to consider volunteering to become monitors. Training is offered as a scheduled for a one-hour, one-on-one session with an instructor. Monitors are club members who volunteer to monitor in the Open Room at the Computer Club facilities. Our main function is to welcome members who come into the room and give them directions when requested. There are no technical skills required to become a monitor. Most members who come to the room are there to use the computers and other devices. If a member should need assistance the monitor may be able to help but monitors only offer help to the level of their knowledge. The monitor usually directs the member to the club website where there are calendars for scheduled classes; help sessions, professional help, and other services. The professionals are suggested only and have no vested relationship with the Computer Club. Their work is independent of the club where fees are applicable from the technician for their services. The Open Room Calendar is available to the monitor for selecting a date and time that is convenient for the monitor. The most important time to volunteer is when there are classes in the classroom and during help sessions. Monitors are given open access to the open room any time of the day or night. We ask that monitors volunteer a minimum of three hours per month. Please reply to schhccm@gmail.com if you have an interest in becoming a monitor. If interested, we will contact you to arrange for a training session. Class Assistants work alongside our Instructors during computer classes assisting students with their hands on experience. A knowledge of the class subject matter; a desire to help others and a few hours of your time is all that is required. No fears, you will be teamed with an experienced CA and receive training annually. Please reply to computercac@gmail.com if you have an interest in becoming a CA. Training involves shadowing a current CA. Are you the person all your friends ask when they have a problem with their computer, smartphone, tablet or watch? Answer YES then this is the volunteer opportunity for You! Help your Computer Club members with their devices while you LEARN and have FUN working with the Help Team. On a regular basis, our Club offers help in either the classroom or the open room. This does not require a high level of knowledge, just the desire to be of service, the ability to Google a problem, or to work with others on the team to solve the issue. We welcome members for PC, Apple, Android, Google and more…wherever you feel comfortable. Sign up is done online so that you can choose the dates and time when you are available. If something interferes with the sign up just notify schccapple@gmail.com so that a replacement can be found. Helpers tell us that being part of service carries its own reward just knowing that you can be there for our members. This is true even if we are not able to help, we are there to listen and make recommendations. The Club President appoints a Facilities Chair. The Facilities Chair is responsible for selecting a diverse committee of 6 – 8 members representing knowledge of equipment, software, networking, etc. This committee meets on a monthly basis to review potential purchases of new equipment, replacement equipment, updated software; changes to the organization of the Computer Center; and other related items. The Chair sits on the Executive Board as a non-voting member and provides monthly reports including recommendation made by the Facilities Committee. Help plan the future of the Computer Club by volunteering for a committee or working with an officer to share your expertise as we continue to move our Club forward. The “Staff” meets monthly; making decisions on purchasing, policy and educational programming just to name a few. Club Officers are nominated annually; voted in at the November General meeting and begin their terms the following January. All members of the Computer Club are welcome to attend and become an active part of the Computer Club administration. For more information reply to Suncityhhccpresident@gmail.com. Classroom Instructors, KK presenters, and SIG Groups are always looking for Computer Club members who are knowledgeable about a topic and would like to share their expertise with others. Don’t be shy, give us a call . . . we will be happy to team you up with an experienced presenter for your first time out if you wish. Please reply to njdebinsc@gmail.com if you have an interest in becoming an Instructor. We will contact you to discuss your areas of expertise. Do you like to organize socials, dinner parties, and get-togethers? If your answer is yes, consider stepping away from technology for just a few hours; join our Team and share your “partying” expertise with us. We have an Annual Holiday Party, Club Fair Activity, Volunteer Thank You Picnic, and other special occasions throughout the year. Please reply to Suncityhhccpresident@gmail.com. You will be contacted to see what areas you are interested in assisting with.